Aspen soccer against Roaring Fork on Saturday, Sept. 15, 2018. (Photo by Austin Colbert/The Aspen Times). The Roaring Fork High School boys soccer team overcame a terrible opening minute to hold off Aspen High on Saturday afternoon on the AHS turf, winning 2-1. Aspen’s Max Brenninger gave the Skiers a 1-0 lead only 30 seconds into the contest, but the Rams were able to bounce back with the game-tying goal with 15 minutes until the break. It was 1-1 at halftime. Fork’s Aidan Sloan made it 2-1 with a goal less than two minutes into the second half, and the defense would do the rest. Roaring Fork, ranked No. 4 in Class 3A, improved to 7-0-1 on the season. The Rams had the No. 1 RPI in the classification as of Saturday evening. Aspen, now 2-3 overall, next travels to Ridgway on Friday. 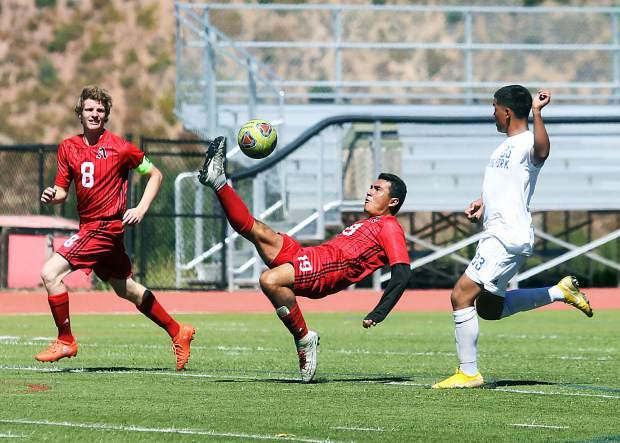 The Basalt High School boys soccer team snapped a two-game skid with an easy 8-0 win Saturday at Moffat County. BHS got to 8-0 with 25 minutes still to play in the contest before coach Brent Hayes pulled the starters. Senior Bear Matthews led the team with three goals, while junior Gaby Bonilla had two. Three others had one each. The Bulldogs fell to 0-5 with the loss, while Basalt improved to 2-5 overall. BHS is now off until traveling to Coal Ridge on Sept. 25. The Aspen High School volleyball team made it three for three on the season with a sweep of host Olathe on Saturday. Set scores were 25-15, 25-18 and 25-7. Olathe fell to 2-7 with the loss. The 3-0 Skiers next head to Phoenix, Arizona, later this week for a two-day tournament against some out-of-state competition. The Basalt High School volleyball team snapped a five-match losing streak Saturday with a thrilling 3-2 win over Rifle inside the BHS gymnasium. It was back and forth the entire way. Rifle won the first set 25-19, while BHS answered to win the second set 25-16. Rifle took the third set 25-16, with Basalt rallying to even it up with a 25-18 win in the fourth set. In the decisive fifth set, the Longhorns held on to win 17-15 to take the match. Rifle fell to 1-9 overall with the loss, while Basalt improved to 3-6. The Longhorns next play Tuesday at Roaring Fork. The Basalt High School softball team went 1-1 on Saturday in a home triangular. In the first game, BHS hosted Faith Christian, ranked No. 5 in Class 3A. The Eagles needed an extra inning to hold off No. 8 Basalt, 9-6, the first loss of the season for the Longhorns. In its second game, Basalt rolled to a 14-4 win over Cedaredge. Faith Christian beat Cedaredge 3-1 in the middle game of the three games in Basalt. The Longhorns, now 8-1 overall, are scheduled to play the Bruins again on Monday in Cedaredge. The Aspen High School softball team lost a pair of home games Saturday to Montezuma-Cortez. Scores were 12-0 and 22-2, dropping AHS to 0-5 on the season. The Aspen High School boys tennis team handled host Dawson on Saturday, winning 6-1 in Lafayette. The only loss for the Skiers came at No. 3 doubles. Aspen now has a week off from play following a busy stretch of matches. AHS next competes Sept. 25 against Vail and Steamboat. Regionals are held the first week of October. The Aspen and Basalt High School cross country teams competed Saturday at the Eagle Valley Invitational at Gypsum Creek Golf Course. The AHS girls finished seventh out of 17 teams, while the BHS girls were ninth. Basalt sophomore Sierra Bower led both teams by taking ninth overall, while AHS sophomore Kylie Kenny was only two spots back in 11th. Aspen sophomore Kendall Clark also recorded a top-20 finish, taking 17th. In the boys race, Aspen finished 10th and Basalt 13th. AHS senior Everett Olson had the best finish for either school, coming in 28th. The Aspen High School junior varsity golf team took second place Friday at the JV championships, held at Chipeta Golf Course in Grand Junction. Cole Kennedy and Jake Doyle took first and second as individuals in the sophomore division, while Lucas Lee was second in the freshmen division. For the AHS varsity team, it is scheduled to play in its regional tournament on Monday at Dos Rios Golf Club in Gunnison. Aspen’s regional foursome will be Jack Hughes, Jack Pevny, Dominic Lanese and Dawson Holmes.